We’re getting close! Circa are starting to remove the protective coverings on the cabinets and prep the boat for launching. You are looking here at the galley. 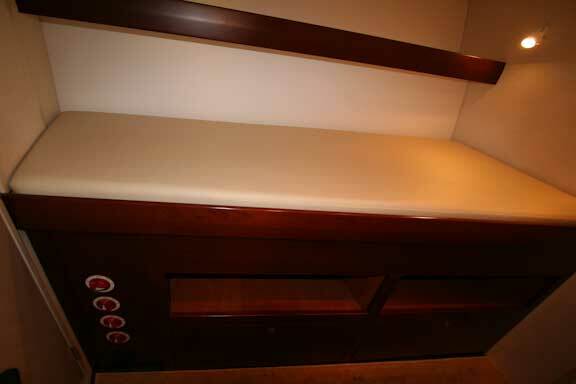 The Owner’s suite is now complete except for the cushions on the seat to starboard and carpeting. While this is a big improvement on what we have been showing you, once art work is installed on the bulkheads the ambiance will be on a much higher plane. 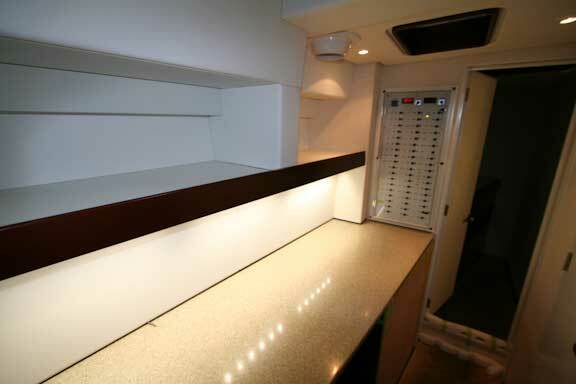 The bunk has walk around space for easy access to the outboard side. 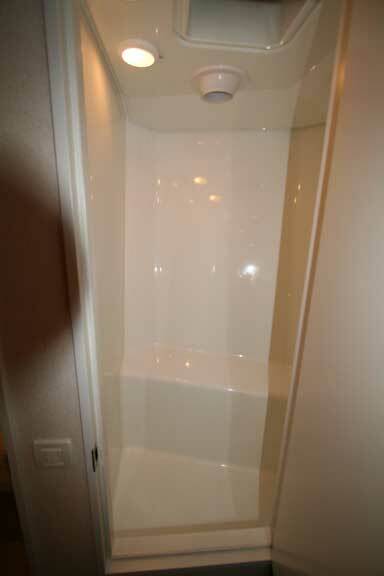 And finally an attempt to show you the bathtub/shower, most of which is hidden behind the bulkhead on the right. Moving now to the completed office. We are at the forward end here, looking aft. As previously mentioned the shelf is sized for notebooks and manuals. We love this design feature. Room to work with a pair of big monitors, with space for the printer, files, and lots of general storage. A finished guest cabin, looking forward. Here we are looking to starboard, down the entry hall to the guest suite. The head is aft, to the right. 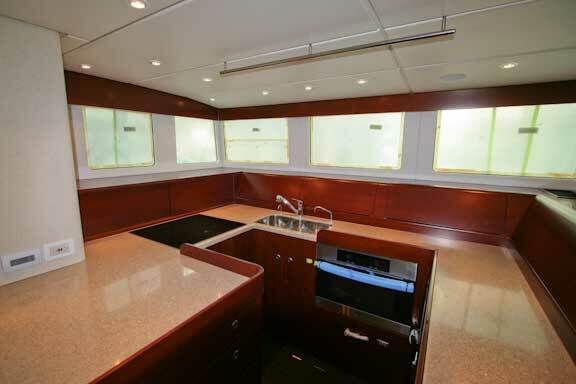 And finally, the aft starboard cabin, looking forward. 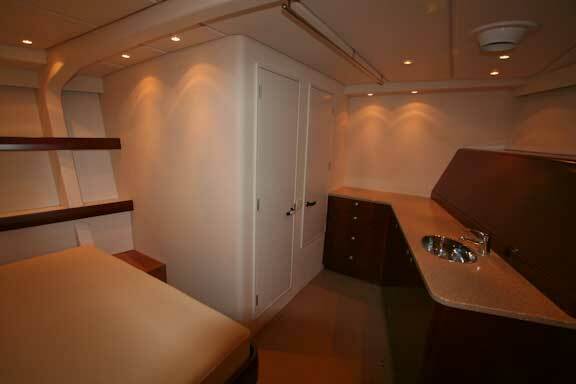 This makes a great extra guest or crew cabin, or it can be used for storage of engine room spares. Check back frequently as there will be lots of updates, including the first shots of the FPB 64 afloat next week. This entry was posted on Thursday, March 11th, 2010 at 11:49 pm and is filed under FPB 64 Updates. Both comments and pings are currently closed. 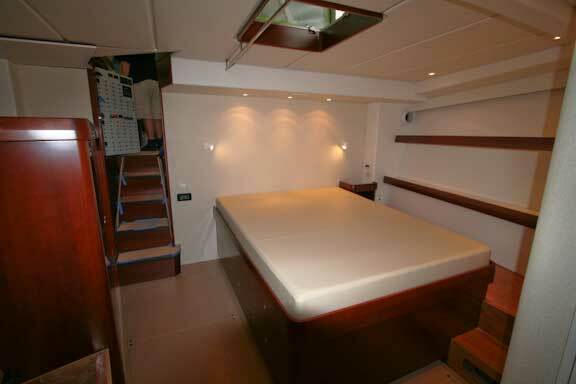 The the two larger bunks are 2050mm (6’8″) long while the aft starboard cabin is an inch/25m shorter. 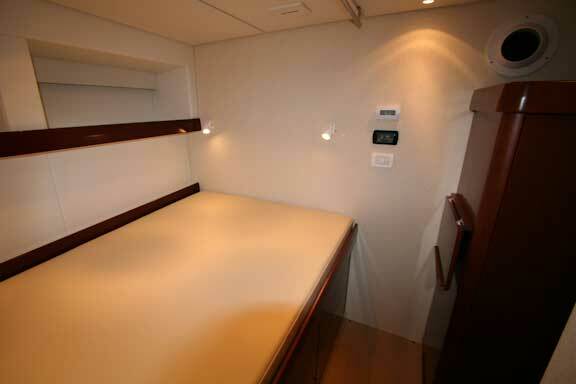 The forward bunk is 1.6m/5.2′ at the head and 250mm/10″ narrower at the foot. 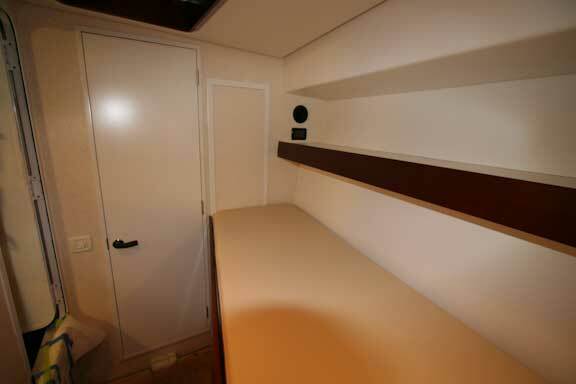 The port guest cabin is 1330/52″ at the head and 200mm/8″ narrower at the foot. 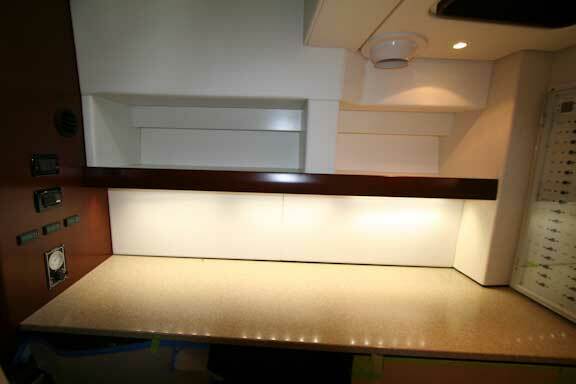 The aft starboard cabin is 625mm/25″ forward and 850mm/33.5″ at the aft end. As mentioned above, everything looks stunning. I was wondering why the head was moved port compared to the FPB 83? 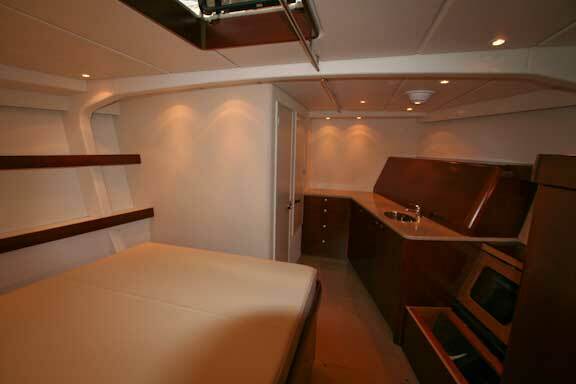 In the drawings of the FPB 64, the head is aft of the shower and in the pics the shower appears to be aft. Also, is it just the difference in the pictures or is the master significantly smaller? It may be on the site and I have not found it yet but I am curious about the significant decrease in size from the prototype. Obviously costs are an issue but what other factors led to the the final dimensions? I am 6’2 and over 200 lbs…..more room is always better. We wrestled for several years with the configuration of the FPB 64, and its length. The 64.8 foot/19.95m length is a compromise of course, but it is sufficient to create an ocean crossing yacht with the speed and heavy weather characteristics to almost match the much larger (and more costly) FPB 83. There are advantages in anchoring and docking space. Being just under 65’/20m keeps us out of the small ship category in many countries, which is a big plus. Regarding the forward stateroom space, once this is fitted with art work it will feel almost as big as the FPB 83. It is visually wider, but somewhat shorter of course. The head shower layout while different than the FPB 83, works very well. As to headroom, three of the first four Owners are your height or above. 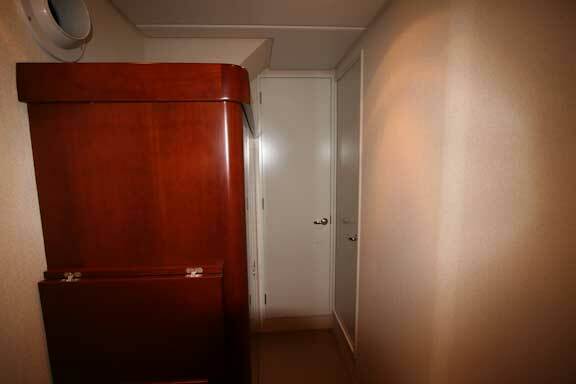 There is nominally headroom of six foot six (2m) forward and in the salon, and 6′ 4″ in the guest cabin. The best way to see how the interior works is to visit the boat in New Zealand.